“That’s just great.” It took me a few moments to realise the words weren’t coming from the radio, but from a cyclist who’d pulled up next to me at a set of traffic lights. He was the owner of a soft-top Mazda MX-5 and, having seen me drive past in the MX-5 RF with the roof down, he’d frantically pedalled after me for a closer look. And he loved what he saw, saying he preferred the styling to his soft-top. That encounter, and several similar ones in various car parks, came to mind when I read Simon Astley’s letter (Your Views, 21 June) in which, among other things, he called the RF “unattractive”. It just shows that styling is personal opinion, which is something everyone is entitled to. And although it may seem superficial, looks do matter with this sort of car. So I decided to so some (entirely unscientific) research: a Twitter poll, asking people whether they preferred the style of the MX-5 soft-top or RF. Result? A 50/50 tie. An unsatisfying finding, sure, but perhaps one that suggests the RF can, as Mazda hopes, carve out its own appeal. Mind you, our RF isn’t looking quite so good after a careless driver reversed into it recently, leaving a dent in the bonnet. More on that next time. Like many an amateur runner, I can usually be found taking part in races at weekends. There are plenty of lovely places to run near my Richmond-upon-Thames home: for example, it’s only a short jog from my house to the start of Kingston Parkrun, which follows a beautiful, flat route alongside the River Thames. Recently, though, I’ve found myself heading further afield for my running fix, into the undulating Hampshire countryside and beyond. That’s meant running up a lot more steep hills, including some fiendishly tough runs on woodland trails. Ouch. The extra leg ache is worth it, though, because driving to rural runs is a perfect excuse to enjoy the MX-5 RF in its natural habitat: flowing country roads. It always performs, too. The steering is beautifully weighted and the gearchange satisfyingly positive. When pressed, the 1.5-litre engine is responsive and it sounds lovely – roof up or down. It’s simply a pleasure to drive. 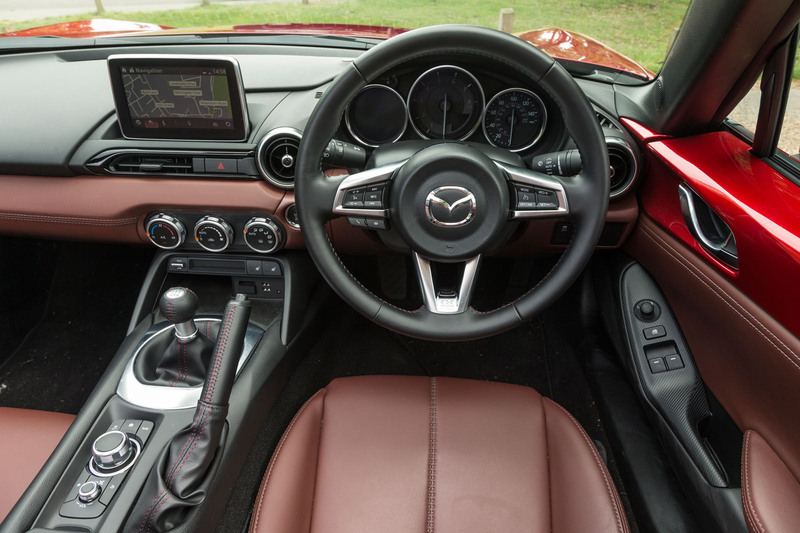 It shows that Mazda’s effort to maintain the traditionally fine MX-5 handling, despite the addition of that heavy folding metal roof, was well worth it. Of course, there’s a reason I’m finding running-based excuses to drive into the countryside: my commute to Autocar Towers in Twickenham is a short, traffic-filled urban trawl on roads blighted with speed bumps and traffic lights. Not exactly the terrain in which an MX-5 is most comfortable, then. But the intention of the RF’s folding hard-top is to make the car more refined and practical, so that you won’t only want to wheel it out on sunny weekends. And the RF is proving surprisingly adept at city life – once you’ve adjusted to looking up at the masses of SUVs on south-west London’s streets. The soft suspension handles speed bumps with ease, and visibility is rarely a problem, even with the roof up and the rear windscreen in place. Also, tight urban manoeuvring is a breeze. A practical city car, then? Not quite. You can’t really call a car with only two seats and a small boot practical. But if you don’t need that space, it holds its own on weekdays – with a glorious pay-off come the weekend. Our new Mazda MX-5 RF has a hard act to follow. The last time Autocar ran an MX-5 as a long-term test car, editor-in-chief Steve Cropley was so impressed that he bought it. He still owns it, too. No pressure, then. So how can the MX-5 RF top that? The answer is with several carefully sculpted pieces of steel, aluminium and plastic, and a clever electrical motor that folds them all up and tucks them neatly away. That would be the Retractable Fastback – or folding hard-top, if you prefer. Hold down a switch on the dashboard and in around 15sec the three parts of the roof will be raised, folded and tucked into a special compartment. It’s all very theatrical. Undoubtedly, the RF’s folding roof takes longer to do its thing than you’d spend manually folding the standard MX-5’s soft-top but, frankly, it’s all a little more refined. And refinement is exactly what Mazda is hoping the RF brings to the MX-5 range. The design also helps to give the MX-5 RF its own identity. The previous-generation MX-5 was available with either a soft-top or a hard-top, but once the lids were tucked away, the two cars looked very similar. That’s not the case any more. They look the same at the front, with Mazda’s stunning ‘Kodo’ design themes giving the long, swooping bonnet an elegant yet menacing look. But when the RF’s hard-top is down, two distinctive rear pillars remain. They ensure you still feel like you’re nestled inside a car, even when you can look up and see sky. They certainly give the RF its own sense of style, which, at the risk of enraging MX-5 purists, I prefer. Which Mazda MX-5 do you prefer the looks of? 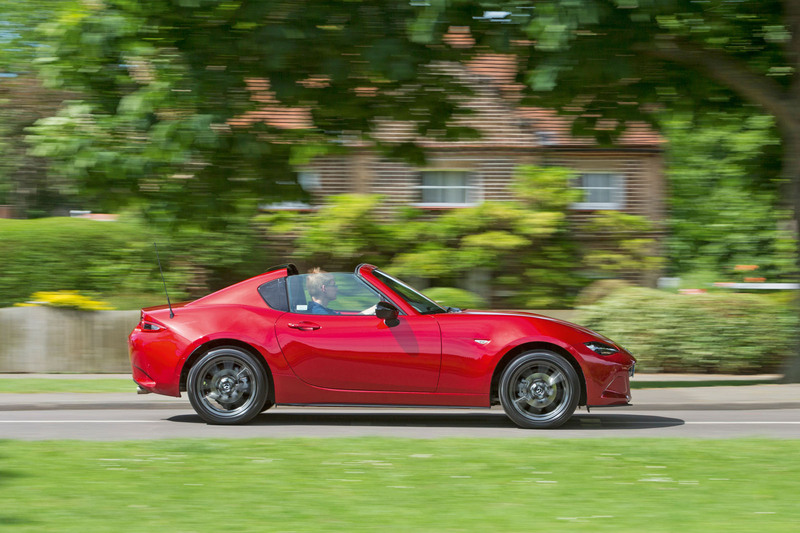 Of course, with the roof up, the difference is even clearer – and the MX-5 RF looks more like a ‘proper’ coupé. In essence, if the MX-5 feels like an open-top sports car with a roof for when conditions get bad, the MX-5 RF feels like a closed-in sports car that you can open up to the elements. It’s a small but significant change in mission statement, one that should move the MX-5 from being a brilliant summer weekend car for countryside cruising into something that can cope better with everyday life. But there are two elephants in the room. The first elephant weighs around 40kg – the difference in weight between the RF and its soft-top sibling. 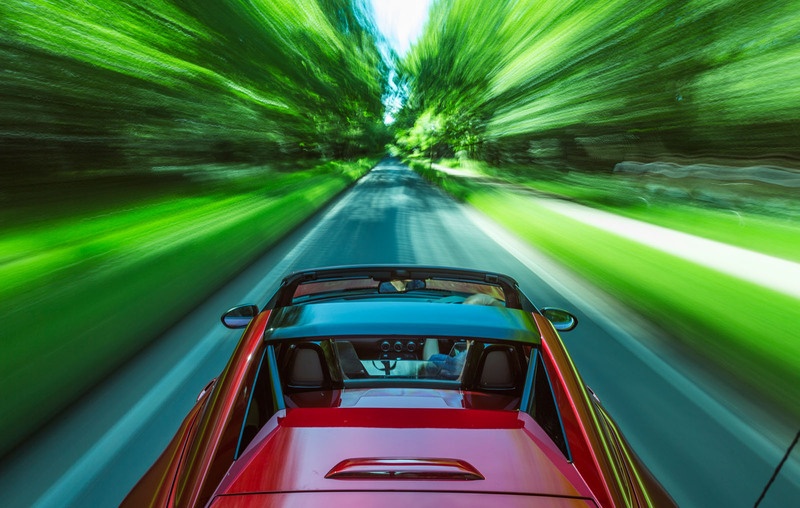 Will that extra weight upset the wonderful ride, handling and balance that make the soft-top fun? Thankfully, that doesn’t seem to be the case. Mazda has tweaked the anti-roll bar and damper settings and done a remarkably good job of maintaining the original car’s feel, our road testers reckon. We’ll be testing that more thoroughly in the coming months, of course, but there’s no doubt that driving the RF is rarely less than fun and engaging. It’s everything you’d want and expect an MX-5 to be. The second elephant in the room is worth around £2000 – the difference in price between the RF and its softtop sibling. Is that extra outlay worth it for the added refinement, comfort and convenience of having a proper roof over your head? Certainly, on the days when I’ve driven home from work in pouring rain, I’ve been very grateful for that roof. But it does have its drawbacks. Getting comfortable in an MX-5 has always been an art form, and with the roof up, the RF is a little… tight. The aim might be refinement, but there’s nothing particularly refined about squeezing into the car when it’s in closed form. I’ve already lost count of the times I’ve headbutted the rearview mirror when clambering in. Refinement is also a bit of an issue at speed, regardless of whether the top is up or down. Get up to motorway speeds with the roof up and there’s noticeable wind noise. While travelling on the motorway, I gave up on a phone call I’d made through the hands-free Bluetooth infotainment system, because on the other end of the line, my mum could barely hear me due to the wind noise. With the top down, the flying buttresses do a decent job of reducing buffeting – but the trade-off is a droning noise, caused by the wind swirling round them. Of course, few people are going to judge an MX-5 based on motorway journeys, but when the aim of the MX-5 RF is to offer a more refined experience, it’s definitely an issue – and, again, one that will need to be investigated and evaluated over the coming months. The roof – and all that entails – isn’t the only major difference between the RF and our previous MX-5 long-termer. The other can be found under the bonnet. Our previous car came with the more powerful 2.0-litre engine, whereas this time we’ve opted for the 129bhp 1.5-litre, still mated to an incredibly satisfying six-speed manual ’box. Perhaps ironically, the 1.5-litre engine arguably offers a more ‘pure’ MX-5 experience and, so far, I’ve rarely found it wanting for power or responsiveness. To reflect the fact that the RF is supposed to offer a refined driving sensation, we’ve opted for the top Sport Nav trim, which includes heated seats, alloy wheels, automatic lights, lane departure warning and a Bose audio system. Adding optional Soul Red metallic paint and nappa leather seats lifted the on-the-road price to £25,965. Styling wise it's a winner with me, I'm not on Twitter so can't vote but I would vote rf, the coupe styling is great roof up or down. I think the RF version is by far the best looking MX-5 since the original first-gen model from back in the late 80s, early 90s. I reckon that a fixed fastback in the manner of that little British sports car of yesteryear would have been a better alternative to the roadster. More chassis rigidity and refinement than the soft top and less weight and complexity than the RF. Toyota gt86/Subaru brz are styled that way though a bit more saloon backed than hatched fastback but agree a straight forward mx5 coupe would be great, almost like the z4 coupe. Surely the poor refinement is the real elephant in the room. No one expects an MX-5 to be as quiet as a Bentley but why is the RF noisier than the soft top? Every road test I've read in US magazines has complained about wind noise and buffeting. If you want refinement, buy the roadster. I like a lot about Mazda's current line-up, but this is a major screw-up. That rear glass is funny. The car is awesome seen from the side but, when you look at it from the back, the way the rear glass meets the buttresses is weird: the glass does not slope backwards with the buttresses (like in the Porsche Targa) and the awesome "coupeness" style is no longer there and you cannot stop thinking about it. I guess the design decision has to do with hiding also the rear glass when the roof is down so that the air can flow. But it looks fake, sorry.